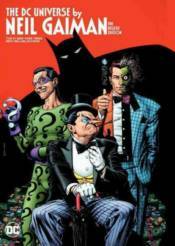 New York Times best-selling author Neil Gaiman's tales of DC's greatest superheroes are collected in a single volume. Gaiman, co-creator of THE SANDMAN and author of American Gods, teams with superstar artist Andy Kubert to tell the story that truly defines the years of Batman's life in the epic 'Whatever Happened to the Caped Crusader?' Also included are stories starring Batman, Poison Ivy, The Riddler, Metamorpho and others from the pages of SECRET ORIGINS #36, SECRET ORIGINS SPECIAL #1, WEDNESDAY COMICS #1-12, BATMAN #686, DETECTIVE COMICS #853 and GREEN LANTERN/SUPERMAN: LEGEND OF THE GREEN FLAME #1.